The spooks of mega stores and online shopping have threatened to haunt retailers in downtown New Plymouth. But the city is abuzz with creative forces aiming to breathe new life into the central business district that will carry it into the future. We don’t know what downtown Devon Street will be delivering in 2050 but there’s one thing everyone could do with more of. Grass. A sunny weekday evening in New Plymouth saw just a couple of families making the most of the graffiti-clad Huatoki Plaza recently. A connector to decorative laneways which intercept bustling bars and takeaway joints, the plaza is oftentimes a contrast in its quietness. “I don’t think anyone thinks it’s a well-used or well-thought-out place,” downtown developer John Shewry says. The sentiment is a recurring theme. Green spaces are vital in slowing foot traffic and causing folks to linger near the businesses that rely on their patronage. Thirty-year olds Jeff Fong and Rosie Sargisson lived in Auckland, Singapore and travelled the globe, residing in inner city apartments while teaching themselves to bake before opening their specialty sourdough bakery and coffee shop. Just a few months old, Billow Bakery is one of a collection of ‘artists and artisans’ from jewellers to jackets, haircuts and accommodation, hosted in the newly opened Quarter Bank development, tucked down a lane off Devon St West. Constructed of shipping containers a la Christchurch’s Re:Start mall, they create an eye-catching space where customers like the element of discovery and residents in the townhouses behind the development enjoy being able to wander through the area and into the city. Jeff and John are keen to see more cohesive projects around the city. “We want to create spaces that are inviting for people, to draw people in and give them something to hang around for,” Jeff says. Rejuvenating Devon St with green spaces for people to relax and eat their lunch in, and providing street entertainment, markets and art on the main strip will benefit businesses both on and off it. “There’s a lot of chat about stuff moving out to The Valley, but this is a chance to have a slightly more service-oriented CBD, Jeff says. The idea that the CBD has begun moving away from traditional retail and towards services such as food and coffee was touted by retail planners and developers First Retail Group at a recent CBD 2050 forum hosted by the New Plymouth District Council. That’s not to say there’s no space for traditional retailers in a CBD, but a strong service-lead industry will ensure the heart of the city keeps on beating well into the future, Jeff reckons. “There’s the chance to get more interaction. Billow Bakery looks onto a hairdresser. Getting a haircut is a treat, someone is doing something to make you feel good,” he says. Blackbird Boutique, Churchwood Bridal, Dalgleish Diamond Jewellers and Jane’s Gallery are among a host of thriving retailers on the main strip, who don’t view mega stores such as The Valley as a threat. Retailers would like to reiterate this, the CBD is not dying. While planning for the long term is critical, so is the immediate future. “We need some actions to happen in the short term, over the next three years,” says Business and Retail Association coordinator Michelle Brennan. A pedestrian area, park and ride facilities, a streetcar, or switching to a one-way system, are among community brainstorm offerings to increase foot traffic on Devon St.
More street art, and literally painting Queen Street red from King Street to the Cenotaph as a symbol of war remembrance were among suggestions submitted to the CBD 2050 Forum. “We want to be the safest, most vibrant, and well-presented CBD in the country. A precinct that engenders a self-perpetuating buzz,” came one comment. The talk needs to be backed up with convincing action, businesses say. “We can come up with some great concepts and ideas but if the council’s hoping they will happen organically, they won’t,” says Kudos Clothing director Paul Scouller. The retail, hospitality, services, banks, community organisations and businesses in the CBD pay generally higher rates than those in other suburbs, yet miss out on fundamental council services. “There is no waste or recycling collection provided in the CBD, which needs to be a top priority,” Michelle Brennan says. Retailers want to expand the renowned Festival of Lights into the daylight hours, with the inclusion of vividly coloured flags flown from street lights. Both the council and business owners agree there is much to be done to upgrade and convert upper levels of buildings into residential dwellings. Double glazing and sound proofing are among areas to be addressed, as is earthquake strengthening. Shaun Biesieck, who is one of the councillors spearheading CBD revitalisation projects, says there are funds available to building owners who need to earthquake-strengthen their sites. Some would like to see older buildings demolished to make way for new developments, while others would like heritage buildings restored to their original glory. Old buildings need to be celebrated for their era, Quarter Bank developer John Shewry reckons. In addition to funds for earthquake proofing, a $325,000 CBD fund, which in the past primarily contributed to one-off events, is now being made available to ongoing services, Shaun Biesiek says. Events such as Cat Stevens, market days, Taste Taranaki, the NZ Tattoo & Art Festival, Americarna, WOMAD pop up festival and the HMNZS Endeavour Parade have all made use of the fund, Shaun says. Now it will also be available to ‘bricks and mortar’ services to revitalise the CBD such as helping building owners freshen their paint jobs and add murals, light lane ways and create green spaces, he says. On the events front, businesses would like to see them run more cohesively and spread out over a calendar year, rather than squeezed into a few months over summer. Ongoing markets such as the food, craft and farmers markets at Huatoki Plaza and the carpark behind The Mill are a positive step in the right direction, John Shewry says. The White Hart Hotel restoration project is a shining example of teamwork between the council and developers, to earthquake proof and restore the 132 year old building into something worth celebrating. It is the core of the popular West End Precinct. The area’s founding families, including restaurateurs the McFarlane’s and land developers the Boddingtons, have created a successful network of businesses around the King, Queen and Egmont Streets area, making use of the existing public art galleries. Kia Ora magazine recently placed the WEP as one of the top three destinations in Taranaki. “The McFarlane’s are the reason things are good, not the bloody council,” patron and property developer Paul Carrington jokes. The offerings of the WEP, including the White Hart Complex, are some of the nation’s best, he reckons. Paul has developed ‘lock up and leave’ townhouses downtown which are popular with retirees, and he’s planning more around the city. He would love to see downtown gated communities with easy-care gardens and boardwalks, as are popular in larger cities overseas. That’s when cityscape green spaces such as at Puke Ariki Landing, become important. 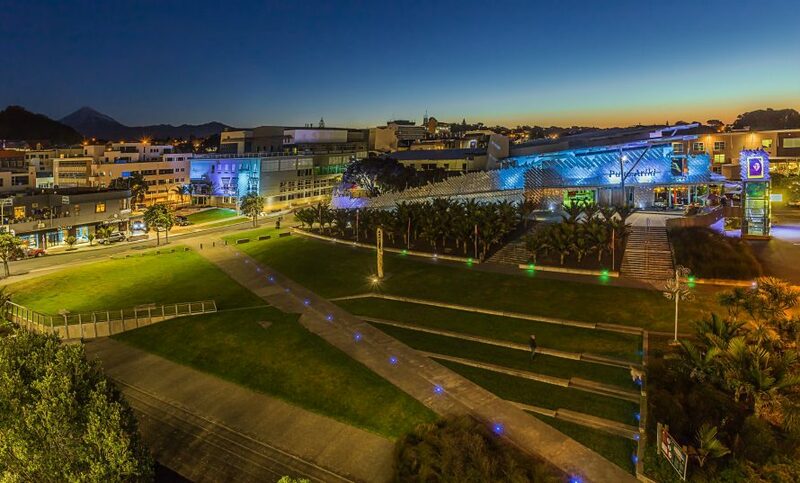 He equally wants to see long-discussed plans to revitalise the frontage of the Len Lye Centre with green space to go ahead, and for the ‘greening up’ of Huatoki Plaza. He reckons carparks will always be needed, even by inner-city dwellers and says they need to be included in plans. Converting the upper levels of businesses into residential spaces and developing more inner-city apartments and town houses would boost pedestrian numbers in the CBD. Adnan and Elle Belushi, who recently developed the Johnson Corner shared workspace on Devon and Brougham Sts, were among submitters to feed their ideas to the council. “If we work in the city, we choose to live in the city; if we live in the city, we embrace it and infuse it with our energy,” is their philosophy. Car parking is one of the big issues for the CBD, but there’s a lot of different ways of skinning the cat, according to Chris Wilkinson of First Retail Group. Mayor Neil Holdom knows how contentious parking is. “Do I want another term?” he says, only half jokingly. “Our CBD is looking a bit tired. I like the idea of taking revenue and reinvesting it. Downtown parking is actually ample but could be managed better, Shaun Biesick says. At the moment occupancy of car parks runs at about 42 percent. The Downtown Carpark building is never full, but not everyone likes to use it. Some visitors are put off by the fact they can only pay by cash. Shaun himself prefers the carpark underneath The Warehouse when he dines out or heads to the movies, as it’s reliable and safe. As for on-street parking, Shaun is listening to retailers who would like car parking charges extended into the evening. After 5pm car parks are often full, but bar and restaurant owners are opposed to extending parking charges into the evening, saying it will deter diners. A two-hour limit on evening carparks might be a better option, he believes. The CBD needs one hour of free parking to compete with the free carparks on offer at megacentre The Valley in Waiwhakaiho, Michelle Brennan says. WEP members agree this will motivate people to come into the city and maintain a good rotation of carparks. They see a need for more angled parking on lower Queen and Robe streets. But they want no charges for evening customers and prefer a reasonable time limit instead. All parking revenue, including fines, should be used for CBD projects and not to subsidise residential rates, Michelle says. This would result in a war chest in the millions rather than the $325,000 that currently contributes to projects downtown and pays a city coordinator to run the See It in the City programme of events. While we don’t have the population to support steady public transport, being an energy province means we need to consider more sustainable modes of transport, developer John Shewry adds. “California, Amsterdam, Copenhagen, Melbourne, they all make good use of electric scooters and bikes where you use your Eftpos card and pay for them and they get picked up,” he says. There’s a prime opportunity for one of the local energy companies to sponsor a solar street car or tram, or something that can utilise the railway into town from Ngamotu Beach, East End beach and the retail developments at Waiwhakaiho. The one thing every party agrees on is that downtown New Plymouth is worth fighting for. A CBD needs to harness a city’s own unique vibe, rather than try to imitate others. “The aim should be to create ‘pedestrian primacy’, slow people down and encourage them to linger,” he says.